Slip into some cozy black pajamas and avoid bear traps. You know, Tenchu style. 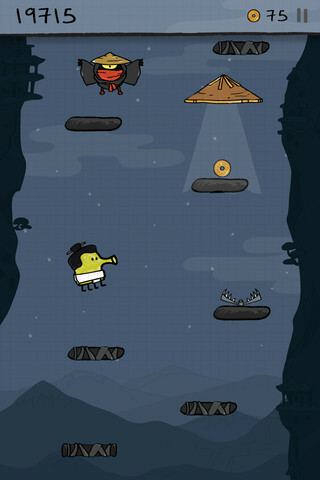 Doodle Jump, despite its popularity, rarely gets mentioned on a routine basis, largely because publisher Lima Sky doesn't frequently update the game. This changed today, as Doodle Jump Version 3.0 made a welcome appearance on the App Store. Described as the biggest update yet, the downloadable content adds a super cool ninja theme, complete with a new backdrop, power-ups, enemies, and obstacles (bear traps). What's more, players can make use of different outfits with powerful abilities. There's the Sumo costume (stomp platforms to shake monsters off the screen), the Double Jumper (jump twice with one jump) and the Shadow disguise (makes you invisible to monsters). Definitely great to see Doodle Jump hop back into the spotlight. That said, make sure you download the update pronto.